It has been years... literally, since the idea to create this essence first found itself floating around in my head. The finished essence was created using only natural materials including my house amber and botanical musk. 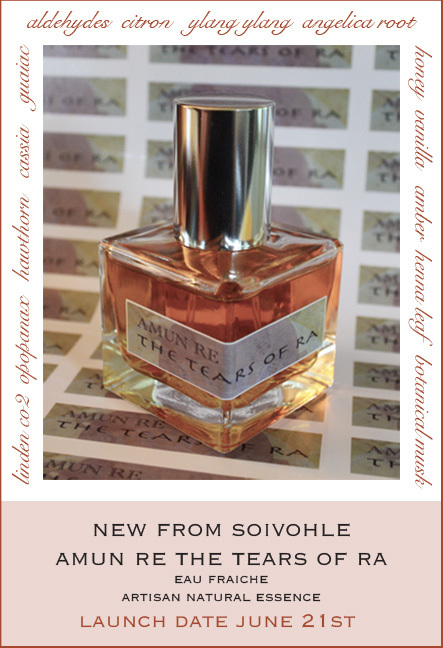 My desire was not to recreate the scent of salty tears and honey, or to create a scent dominated by these notes. In the end though there is a hint of saltiness that mingles with honey, flowers and musk. There are many versions of the story of the Egyptian Sun God Ra. Depending on the specific period in history Ra can be seen as a team player in the Egyptian Pantheon of Gods, or as in later years an Amun, Creator God. I would imagine that the first telling of the story "The Tears of Ra" came from this era. It is a creation myth that sets Ra as the high creator Amun Re who's tears are either honey or honey bees (various stories exist) that fall from the heavens only to transform into the first humans when touching the earth.